Compressed air is used extensively throughout all sectors of industry. However, in certain applications such as the pharmaceutical industry, it is crucial that the compressed air supplied is completely free of contaminants such as oil vapour, moisture and particulates. “In particular, contaminant-free air is a requirement for the air supply to ‘clean rooms’ used in pharmaceutical manufacturing where, for obvious reasons, exceptionally stringent hygiene regulations apply,” explains Rand-Air’s Fleet Manager Craig Swart. Clean rooms require large volumes of air – usually at a controlled temperature and humidity. This means that in most facilities, the cleanrooms Air Handling Units (AHUs) consume over 60% of all the site power. As a general rule of thumb, the cleaner the cleanroom needs to be, the more air the AHU will need to use. To reduce the expense of modifying the ambient temperature or humidity, AHUs are designed to recirculate (if product characteristics permit) about 80% air through the room, removing particulate contamination as is it generated, while simultaneously keeping the temperature and humidity stable. Pharmaceutical manufacturers need to protect their hard-won reputations by adhering to guidelines such as those outlined in international codes International Standard ISO 14644, Cleanrooms and controlled environments-Part 1: Classification of air cleanliness, and Part 2: Specifications for testing and monitoring to prove continued compliance with ISO 14644-1. To achieve the above compliance, these manufacturers need to employ the latest technology, such as certified Class 0 oil-free compressors. These will ensure their processing systems remain contaminant-free at all times – as only Class 0 oil-free compressors can guarantee total air purity in pharmaceutical processing. A pioneer in oil-free compressor technology, Atlas Copco has set the standard for contamination-free compressed air in the pharmaceutical industry. The first compressor manufacturer to achieve ISO 8573-1 (2010) Class 0 clean air (the most stringent classification), Atlas Copco compressors ensure that the compressed air in pharmaceutical production processes is free from any oils which could compromise quality of the pharmaceuticals produced. Oil-free compressed air is used throughout industry where air quality is critical to the end product and processes. “Rand-Air has the right solution in that it is able to supply pharmaceutical manufacturers’ clean rooms with oil-free compressors, which have a TUV Class 0 certification according to the ISO 8573-1 standard. With this assurance, pharmaceutical manufacturers can have peace of mind that they are guaranteed fully sterile and hygienic, 100% oil-free compressed air,” continues Swart. The evolution of this stringent standard reflects the ever-increasing need for quality air for manufacturing processes and end-products. Class 0 is a more stringent standard, where the total oil content is measured – not only aerosols and liquids, but vapours as well – by the internationally recognised TUV organisation. 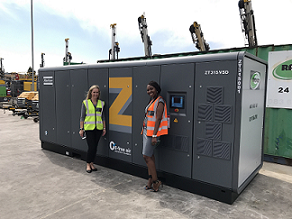 Rand-Air sources its oil free compressors from Atlas Copco, which put these units through the most rigorous tests available; and which is now the first manufacturer to receive Class 0 Certification for all its oil-free products. “At Rand-Air, we have a range of oil-free compressors to suit most applications and requirements,” says Rand-Air’s Sales Manager Kim Coetzee. “So if the manufacturing requirement is for oil-free compressed air for an environment such as a clean room, one has to ask: ‘Why take the risk of damage to reputation and to the health of others by using anything else?’ A Class 0 oil-free compressor from Rand-Air is ideal for the pharmaceutical industry, and for all clean room-applications in particular,” she concludes.